The content of this article provides interesting history, facts and information about Roman Executions at the Colosseum. Hundreds of thousands of lives were lost in Roman arenas, including the Colosseum. 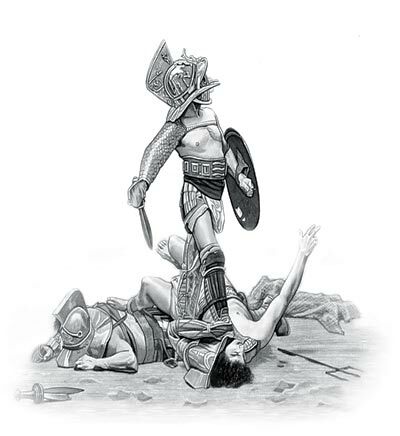 Not just the gladiators but also helpless men, women and children of all ages who were sentenced to die in the Roman Executions at the Colosseum. The victims of Roman Executions at the Colosseum and other arenas were Executions were criminals, Roman Army deserters, rebels, traitors, runaway slaves and those guilty of various sorts of antisocial behavior, such as the Christians. There were many different types of executions in Roman arenas and the Colosseum. Many were executed as common criminals by crucifixion or "damnatio ad bestia" (thrown to the wild beasts). The vicious and cruel Romans delighted in even more novel ways of executing Christian Martyrs. The Emperor Nero introduced twilight executions where hapless Christians were nailed to the cross and burned alive as torches to light the arena of the Colosseum. Others were thrown to wild animals. Roman Executions at the Colosseum included the terrible sentence of Crucifixion. The punishment of crucifixion was chiefly inflicted on slaves and the worst kind of criminals, including Christians. The criminal was stripped of his clothes and nailed or bound to the cross. the whole body weight being supported by the stretched arms. When nailed to the cross there was a massive strain put on the wrists, arms and shoulders often resulting in a dislocation of the shoulder and elbow joints and the pressure on chest made it impossible to take full breaths. The Romans loved novelty and Saint Peter was crucified upside down during the rule of the Roman Emperor Nero. No Roman citizen could be sentenced to crucifixion. Roman Citizens were not crucified (Roman Crucifixion), they were beheaded. This explains why, despite being found guilty of the same crime, St. Paul and St. Peter faced different fates. St. Paul was beheaded because he was a Roman Citizen. St. Peter who was not a Roman citizen, was crucified. The Roman Executions at the Colosseum all ran to a strict schedule, the Gladiators were the main events and 'performed in the late afternoon and early evening. In the morning there were various shows featuring the hunting of wild animals. But during the noon break, and at other times, the arena served as a place of dramatic public execution, including damnatio ad bestias or obiectio feris which meant throwing people to the beasts. Throwing victims to the wild animals was a familiar form of execution. This form of execution was possibly started by the Emperor Augustus who had a pillory erected in the Forum which collapsed and dropped the victim, a man called Selurus into a cage of wild animals. The idea was then used in more spectacular fashions and men women and even children, sentenced ad bestias, were thrown to the wild animals in the arena. The Roman Executions at the Colosseum were sometimes preceded by the most terrible forms of torture. Victims were racked till their bones were out of joint, and others hung up by their hands to hooks, with weights fastened to their feet. The content of this Roman Executions at the Colosseum category on life in Ancient Rome provides free educational details, facts and information for reference and research for schools, colleges and homework. Refer to the Colosseum Sitemap for a comprehensive search on interesting different categories containing the history, facts and information about Ancient Rome. Just like the subject of Roman Executions at the Colosseum there is hardly a page of Roman history and the Romans that is not, on some way, connected to the Roman Colosseum which became a symbol of Rome, its society, culture and life.